Halloween is in the air, with all of today's product introductions!! Whether you create Halloween cards and treats for little ones or maybe all your grown-up friends, we've got some new items we think might be just the ticket for making this year's crafting even more spooktacularly special! Send some adorable Halloween hugs to loved ones and little ones this season! Combine the cute halloween characters in this set with the Tag Sale: Huggable die to create fun, giftable treats and projects. This set contains all of the elements needed to transform the Tag Sale: Huggable die into an adorable cat, frankenstein, or vampire. Then wrap their arms around gift cards, candy, mason jars filled with goodies, and more – or use them to create fun interactive tags and cards! Coordinates with the originally released Tag Sale: Huggable Die Collection. Available for purchase August 15th. CLICK HERE for further product details. Celebrate the ghoulish side of Halloween with Wicked Elixir. This set includes all of the essentials for a mischievous alchemist’s spooky pantry. Brew up terrible tinctures with Eye Of Newt, Vampire Blood, and Spider Venom…if you dare. 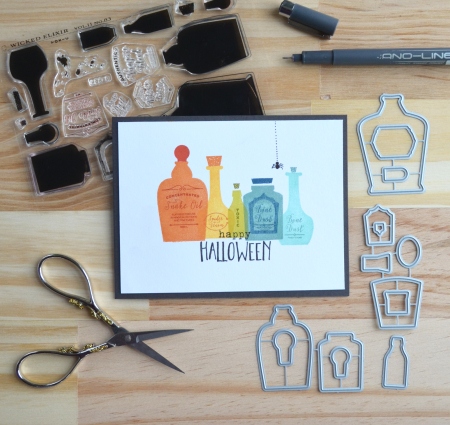 This set is perfect for creating cards and treat packaging to give your loved ones the willies this All Hallows’ Eve! These dies can be used in a variety of ways. 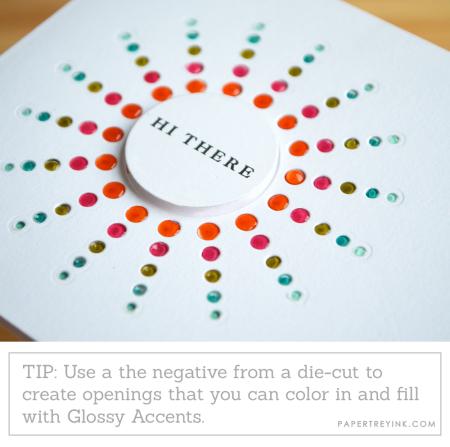 Cut them out of white cardstock and back them with a colorful watercolored or sponged background. 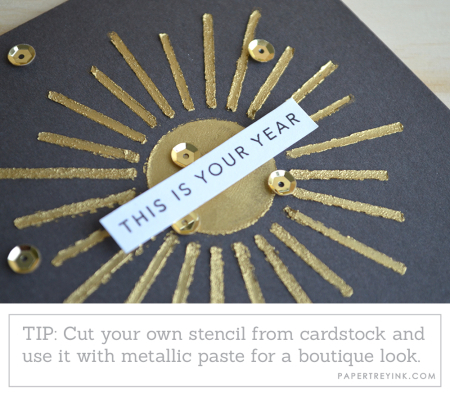 Emboss them into your card front. Cut them out of a card front, then inset a second set of cuts in an alternative color. Fill the openings with Glossy Accents. Cut your own stencils and use with modeling paste. Have fun playing an experimenting! My first card is a pretty simple design really, with a color scheme that could be adapted for many different recipients and occasions. 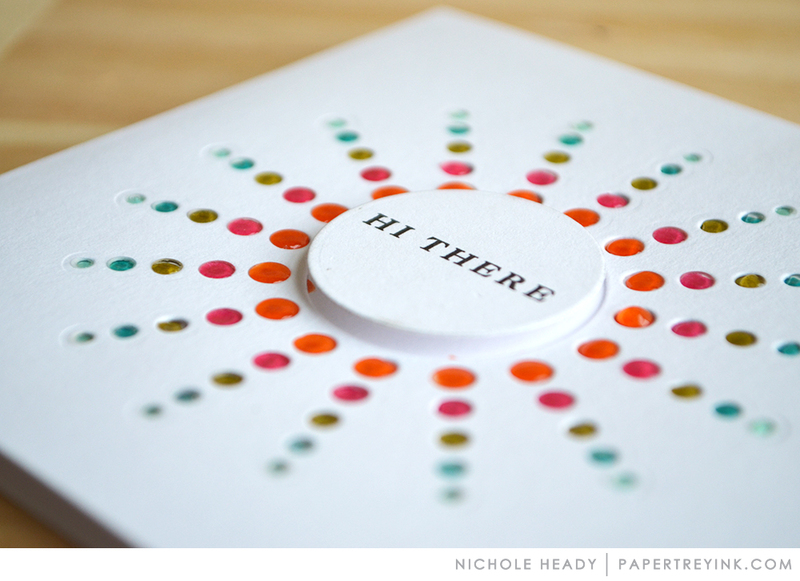 I die-cut the Radiate: Dots from white cardstock. Adding white cardstock behind it, I marked the circle openings carefully with a pencil and colored them in with Copic Markers. I adhered the colored white panel behind the die-cut cover. I filled each of the opening with Glossy Accents. There is something exciting and therapeutic about placing all those perfect little drops! You can also create your own stencils from the new Radiate dies, like I did here with the Dashes. I opted to use mine with metallic paste. I love all the texture this adds! After it was done drying, I added the small sentiment strip and sequins. All of the various sizes and shapes of bottled included in Lizzie's new Wicked Elixir collection were just begging to be "rainbow-ized", so that's what I did! I stamped all of the bottles in a row, then went back in and added their corks and labels in ink that was a shade darker. The black sentiment needed a little balance, so I added this little spider with a black pen. Isn't this guy just the sweetest? Really, all the characters from Halloween Hugs are! But I especially like Frankie! I opted to cut the pieces from white cardstock and color them with Copies for a more shaded effect. His facial features were stamped in black ink. I took the time to add white dots to the eyes using a white gel pen. Frankie is hugging the new Mix & Mat: Pinked Edge, and when he opens his arms, it reveals a message. You could easily stick a cane bar in here as well if you wish. Having a way to package up pencils AND candy bars in such an adorable way is definitely a way to get to the head of the class! Since al of the various pieces can be cut right from the patterned paper sheets, this is easy enough that kids can help too! These clever book marks are sure to be a big hit with any young crowd. The die-cut "Hugs" word is such a stylish little touch, but it really makes the project. Betsy really showcases that these sweet little characters can "hug" nearly anything, from chips to soda and everything in between! Pairing these up with some of our bold new basic patterned papers is just the thing for the upcoming holiday! I love the addition of the red hearts to the openings in the suns. It is such a nice pop of color! The addition of the scattered rhinestones on the hearts and around the outside of the suns helps to add a lot of visual balance too. Wanda has lots of layers going on here and I love how they all add balance to the hanging tag which is slightly off center. The splattered blood is a fun play on the label for the bottle, without being too over the top. This card has more of an earthy feel to it, with a lot of antiquing and inking, making the bottles and labels take on more of a vintage styling. The small addition of the stamped star cluster helps to connect the bottom and top portions of the card so they aren't left disconnected. I hope you have enjoyed all the creations that I have shared with you today! Are you as excited about the Halloween Hugs mini kit as we are? Or maybe Wicked Elixir is more your style? Is your mind already whirring with ideas for how to use the Radiate die collection in different ways? We would love to hear your initial thoughts on everything we introduced! Please leave a comment on this post to tell us what you think of the new products and you will be eligible to win big! You have until 7am EST, August 13th to leave your comment and be eligible to win. Only one comment per person please. One randomly selected winner will be announced on our August Release Winners Page before noon ET the same day. Thank you for stopping by today and best of luck with the contest! What fun Halloween products! And those radiate dies are very cool! Another terrific day of inspiration. Cheers. super fun and cute projects today ladies! goodness, I would love to have a chance to get together and craft with such a talented and creative group! Love all those new Radiant dies! Halloween Hugs is so fun! Wow these Radiant dies looks amazing. Might have to get all three! 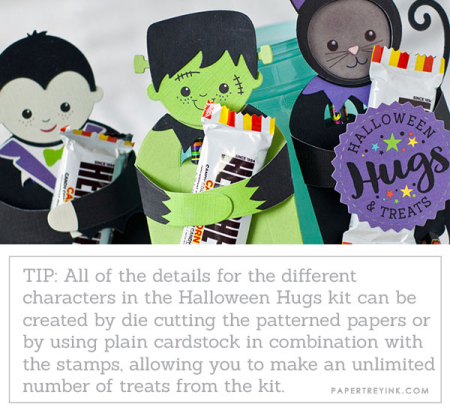 The Halloween Hugs kit is so adorable. Even “big kids” would enjoy them! I can feel Fall coming closer with each day of the release! Great color schemes and dies! The hugs kit is way cute-just as the Christmas one was. The Elixir set and the Radiate dies are perfect for this time of year. Love them all-it’s going to be tough to limit myself with this release. Fun & cute Halloween goodies! Love the huggables & the radiate dies! So super cute! 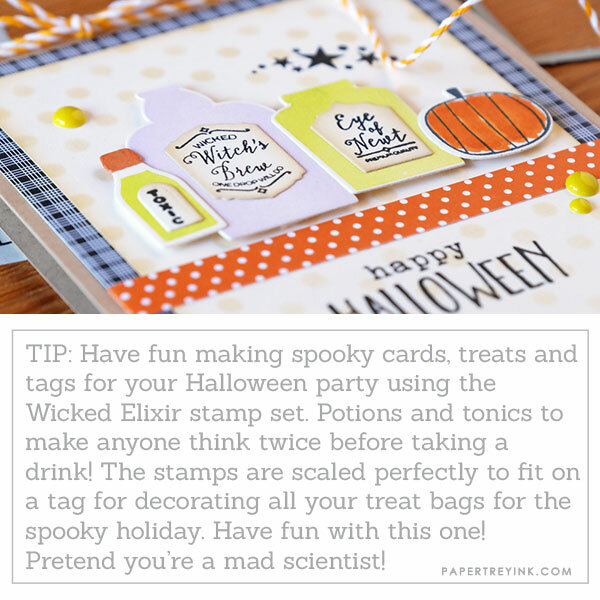 Fun Halloween projects! What a fun Halloween release for everyone of all ages! Those bottles are so cool! Love that sunshine die, too. That sweet scarecrow is so coming to live here this fall! I absolutely love the hugs kit; it is too cute!!! SO excited about this new release all these inspirations are giving me some great ideas,can’t wait. The hugs kit is so cute!! 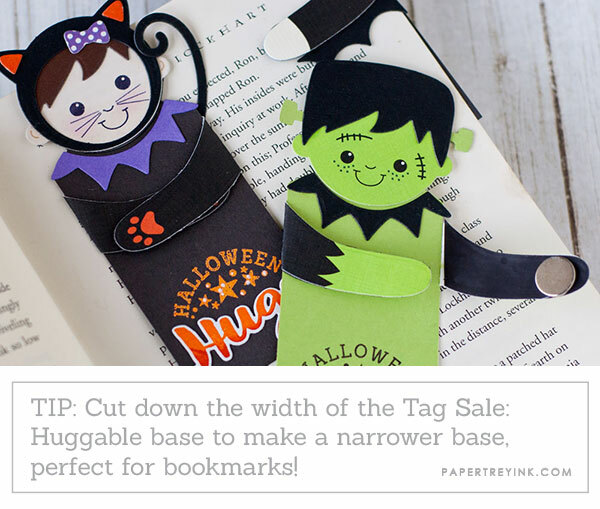 I love the idea of bookmarks using it! Great release! I’m enjoying all these new stamps and dies. I also enjoy all the ideas and creativity. Each card or “hug” is so much fun! I love the elixir bottles and radiating sun dies! Those radiant dies are intriguing–love what the team has done with them! 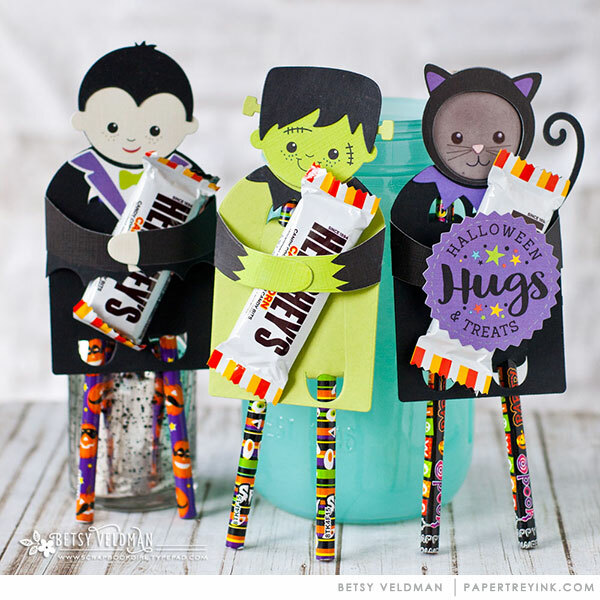 Love everything about the Halloween Hugs kit! That Betsy does such a good job at tempting me each and every month. Grrrr! Sweet Halloween Hugs kit! All the projects are so cute! these new Halloween sets are so fun! Super cute projects from everyone!! Love the Wicked Elixir! So neat & spooky for Halloween! Love the hugs kit! It is totally adorable! 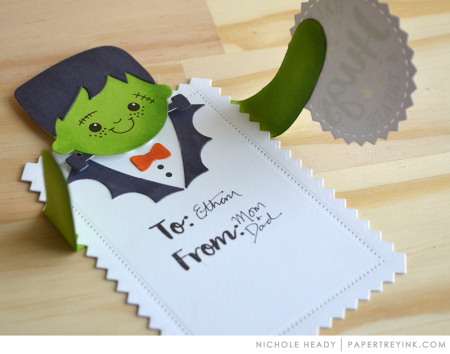 We loved the Holiday Hugs – so, the Halloween Hugs will be a big hit in our home. I love the radiate dies! They are so beautiful and versatile. I am IN LOVE with the huggable collection. What fun it would be to make treats with those cute faces. Betsy’s new huggable set is just a delight. The little cat and vampire are my favorites! Cool radial dots and dash dies! Today’s projects are definitely getting me in the mood for Halloween. Very inspiring! What a fun release day preview!!! Love the wicked elixirs and the Halloween hugs ❤️ So many amazing designs done by the team. 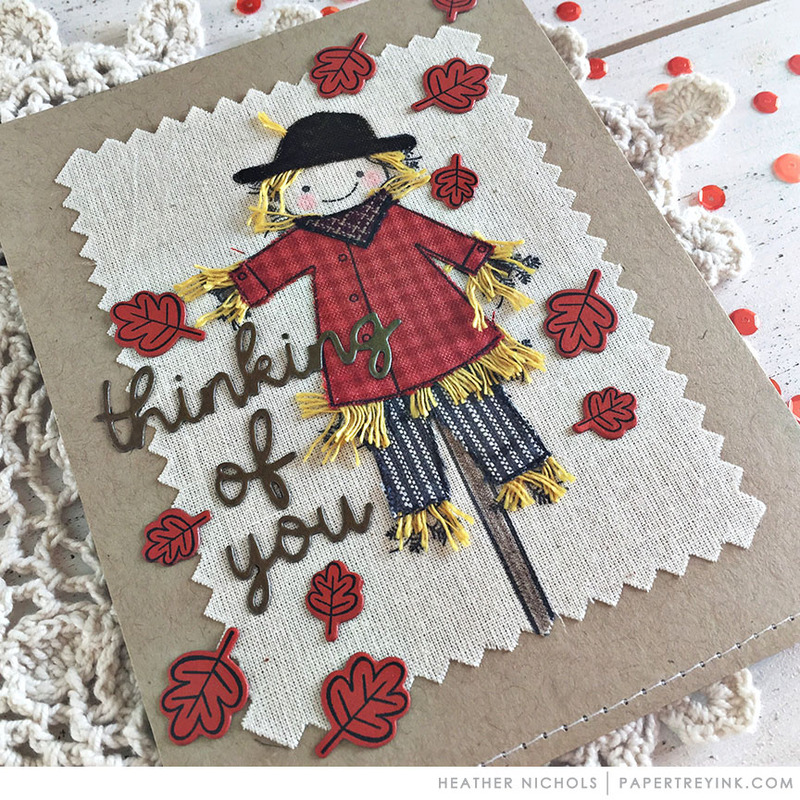 Heathers card done with the autumn scarecrow is just adorable!! Eep!! The Halloween dies are soo adorable! Love at first sight! Fun day- Betsy’s Hugs are cute…And I’m still loving the scarecrow!!! I love Halloween stamps and these are some fun new additions! 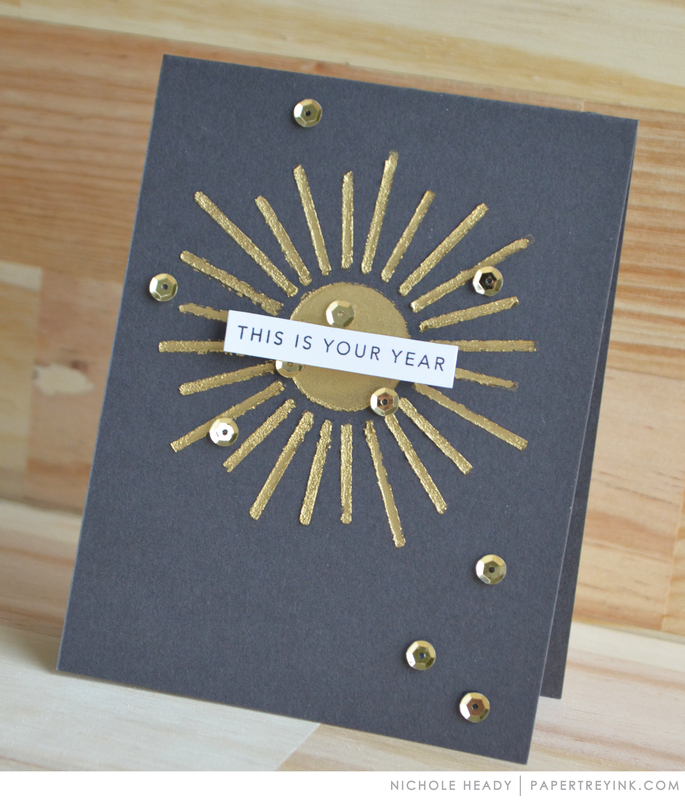 Love the new sunburst-style dies. Love the Halloween hugs, such a great way to give treats during Halloween. Lots of fun and cute stuff—love the wicked elixir!!! 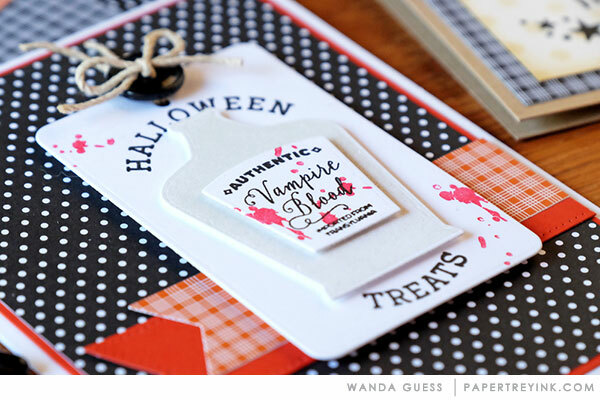 Love the Halloween Hugs kit, the radiate dies and the new Bitty Big paper! Great card inspiration today too! My grandkids are getting Halloween cards from the Halloween Hugs kit this year! Thank you! Cutest kits EVER!! Who ever came up with the arms being about to hug is a genius!! The little Frankenstein is adorable. Very cute release thus far. The radiate dies are cool! But oh my!!! That scarecrow card by Heather Nichols is ADORABLE!!! One of the cutest cards ever! 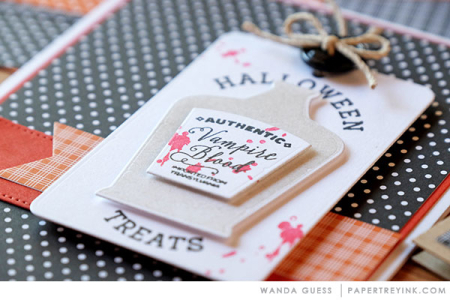 So much FUN Halloween goodies…I can’t wait! Heather’s sewing card is awesome! Great colors for Betsy’s Halloween kit, the sun motifs would be fun with mirror in the middle. 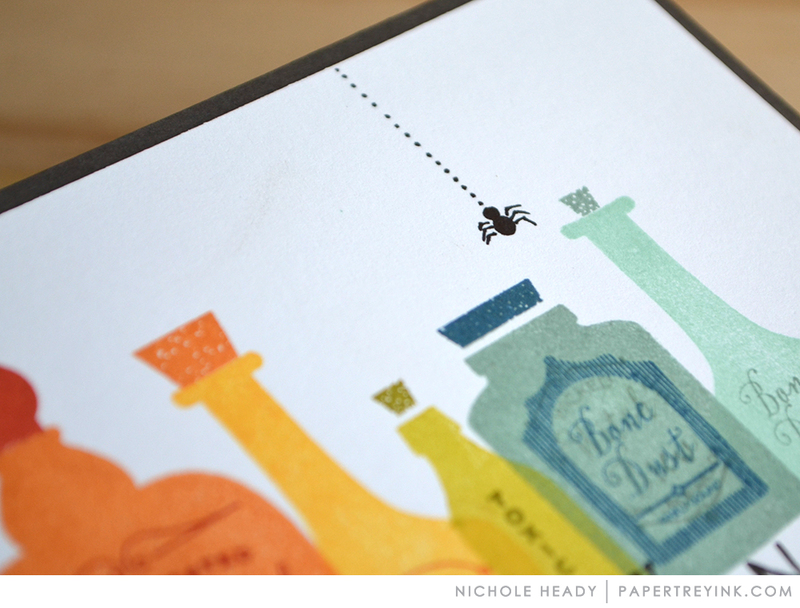 Liking the new radiant dies – cool idea! Wicked Elixir looks like such a fun stamp set! The Halloween Hugs kit is adorable! Great ideas on how to use the figures and I really liked them as book markers, too – so cute! Everything is so fun today! We have a cute set, neato dies, and the elixir set is so cool! My daughter’s birthday is the day before Halloween, so she’s always had a soft spot for this holiday. These supplies are everything you need to make it fun! Loving the awesome design team samples – so cool! I love all the radiant dies! They will be so fun to use! Love the radiate dies, especially the dots. Top of my growing list so far. Love the radiate dies!!!!!!! Can see this used in so many ways!!! Love your projects with it especially the colored dots!! Pencil legs? Bookmarks? Jar and can hugs? Betsy’s clever ideas for the Halloween kit are just too cute! All the Halloween treat projects are very cute. Love the little monsters. I especially like the Radiate Dashes dies. Very cool! Love those radiate dies and the idea of creating stencils with them gives them lots of extra uses! The Halloween Hugables are cute! Halloween Hugs has my heart today. They are simply adorable!!!!!!! Wicked elixir is a must have for me! Adorable! The hugs kit is my favorite. Yay! I’ve been hoping there would be a new addition to the huggable kit! It is super cute. Will there be a Valentine one?? Great stuff! I really love the single packaging on the dies. love the hugs kit and the bookmarks are great!! I love the Wicked Elixir set and those Radiant Dies – gah!! Betsy’s latest – Halloween Hugs – so cute! Did I see mentioned – new papers?? Bitty Big Yay!! Those bookmarks are the BEST!!! 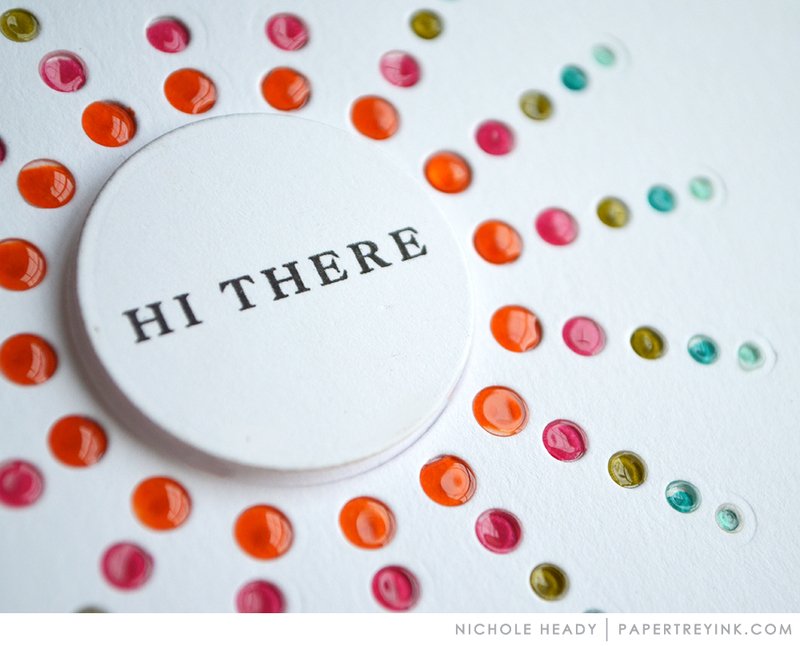 LOVE the Radiate dies – especially the dots!! I’m always excited for fall to arrive and these products will make it even better! Love the radiate dies and I’m totally in love with Heather’s scarecrow! 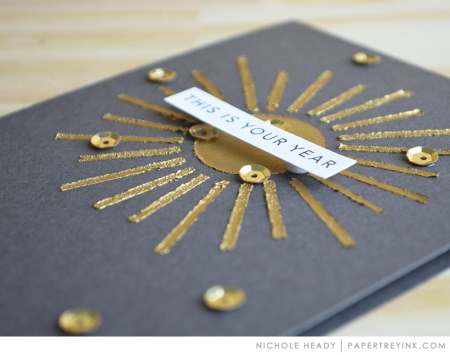 I love the radiate dies, especially the idea of using them as stencils! Halloween Hugs is super cute. My absolute favorite time of year to create! What great Halloween products. So cute and fun. Thanks for all the inspiration! The more I see how you ladies are using the goodies in this release, the more I like it! There is something for everyone – stampers with kids/grandkids and those of us in that spot with big kids and no grandkids. For me- the background dies with the funky edges are a must have. Picking the shape is going to be the hard part! LOVE all the Halloween products! So Fun!! I love the Wicked Elixir, perfect for Halloween!! The Halloween Hugs are adorable too!! Wow, wow, wow!!! !I can’t wait to get stamping!! Great Fall stamps! These are absolutely adorable. I love the Halloween Hugs the most. What fun all these new Halloween goodies are! Love the radiant dies too!! Those Halloween Hugs with the pencil legs are adorable! Love those smiling faces! Wow, wow, wow–absolutely love those radiate dies! Radiate dies look fab to use. The Radiate dies are so cool! Great ideas today. So unique and very cool designs!!! The Halloween Hugs bare adorable. I really like the Radiate dies. The Radiant Dies are very intriguing! Leave it to PTI to always come up with something new. I love Betsy’s kit too, but no kid around to make things for…. I love the new radiate dies! Love the Radiate dies! They are must have. Love Wicked Elixir so much! Love all the examples with the sets–especially the tips! 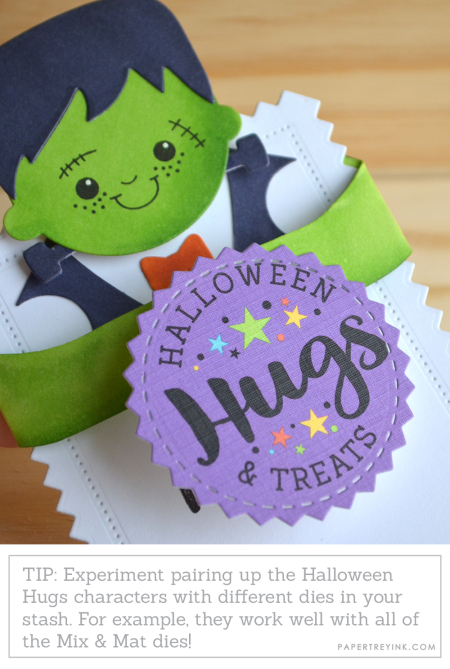 Halloween Hugs is just the perfect Halloween kit! What a fun collection! I love the radiate dies! The Radiate dies look amazing! I really don’t like scary Halloween items but these new dies for the characters are super adorable and cute! wow, love the radiating dots die! So many beautiful new products. 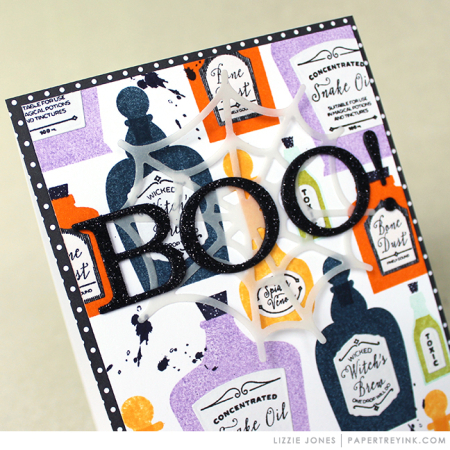 Love the Halloween Hugs Kit and all of the Radiate Dies! Awesome examples! Halloween Hugs is adorable, and the Radiate dies are so unique! I need those Halloween hugs! Oh wow!!! How adorable little Halloween projects!!! Love them!!! I like so much the new Radiate: Dots die set!!! I like the radiant dies. I can see they would a subtle or bold design inside or outside a card. I really love those Radiate dies! I love the radiating suns. Those could be used to add layers are so many cards. 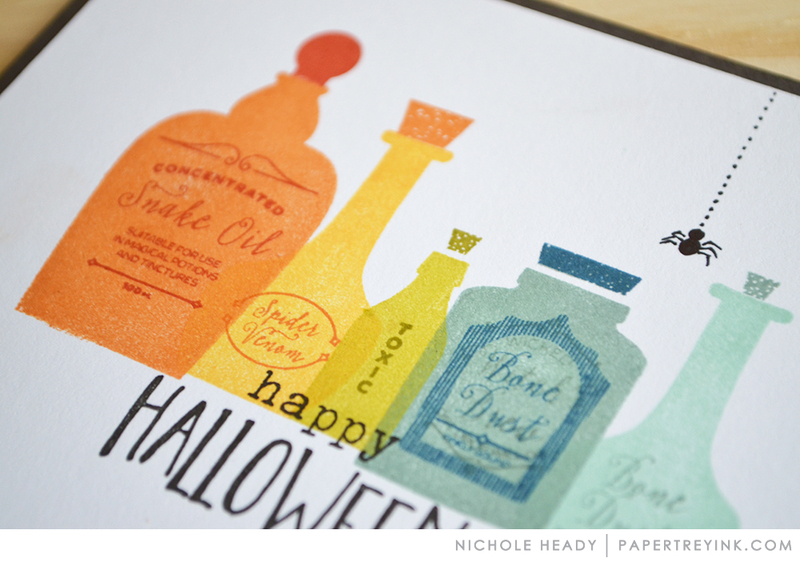 Halloween is my favorite holiday I am in love with Wicked Elixir, this is one fabulous stamp set! These Halloween projects are so cute! What fun Radiate dies & lovely inspiration. LOVE the little Halloween cuties!!!!!! Oh my the Halloween Hugs are so cute!!! The Halloween Hugs are just too cute! Wow, what a fun day. You are so talented. I love the ideas! Your releases are always so amazing and this one looks like a winner!! These are amazing…I want them all!!!! Such a cute kit for kids and adults who are kids at heart! Very cute Halloween sets and inspiration! Love those Radiate dies – perfect for sunshine cards – and the Wicked Elixir set – such fun! Also loving the peeks at the Bitty Big papers, can’t wait to see more about it! Elixir is fun. I love the new Radiate dies. Heather, your scarecrow using fabric is too cute and clever! Love it! These radiant dies are fantastic! 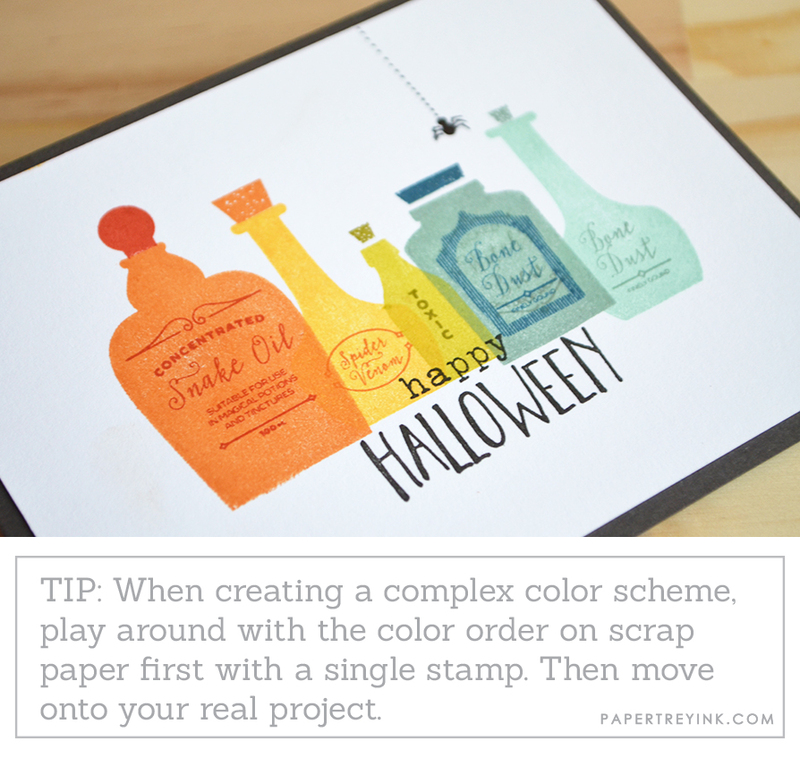 Fun Halloween projects. Like the new Radiant Dies. Everything is so FUN!!! LOVE Lizzie’s Elixir bottles. I made some real ones for myself a few years ago. I had a blast and they are so cute!!! All the projects are amazing!!!! Can’t wait to start making Halloween projects!!! Awesome release!!! I like the Wicked Elixir set! I’m loving the Radiate dies. The Halloween Hugs are really cute. I love the Wicked Elixir! The cards created using them with a blood spatter is ingenious! LOVE it all – great photos, great product – everything perfect for creating. Happy Holidays! The radiate dies look like so much fun to use! They are now on my need list! THese Halloween sets are just too cute! 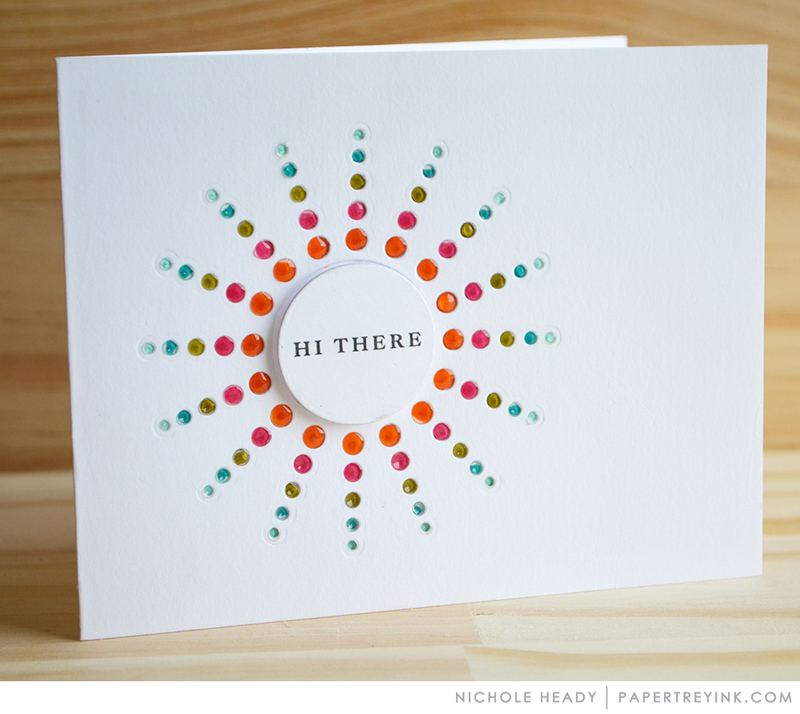 That Radiate: Dots die card with all the glossy colorful dots is SO COOL! Oh my…those Radiate dies are amazing! They will definitely land in my cart this week. I’ll have to put Wicked Elixir on my list as well. I don’t even celebrate Halloween any more, but I like all the bottle shapes! I love all the new Radiate dies. Can hardly wait to own them! My children are grown, but I adore the faces of the characters in the new kit. Looking forward to more great autumn themed reveals. I love this time of month at PapertreyInk! OMG … I’m having trouble digesting all of this Halloween cuteness! Betsy’s bookmarks are just the cutest! Great projects everyone! The Halloween Hugs set is so cute. The Halloween Hugs are so adorable! 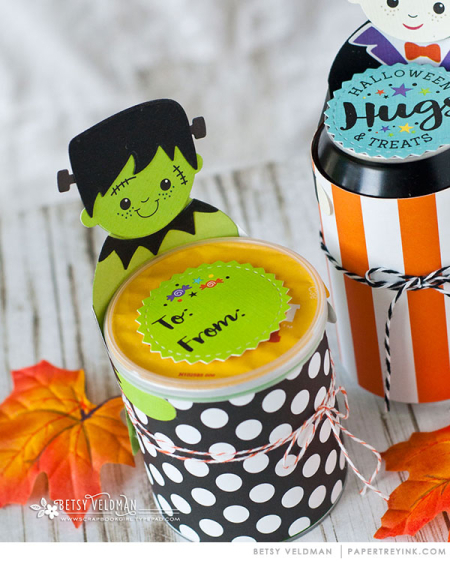 These are the cutest Halloween stamps and dies! And I love the names you come up with too!! The glossy accents on the rainbow radiant circle card really make it pop. I can really see year round use for this one, changing out the sentiment. Thanks to the design team, lovely cards!! Love the cute Halloween cards! The Halloween Hugs kit is soooooo cute! Oooh, patterned paper is back!!!!!! Another great day of inspiration! Love all the cool bottle shapes in Wicked Elixir! Best Halloween collection ever. Love the Wicked Elixir and Halloween Hugs. Love the radiate die collection! Oh my goodness…the Halloween Hugs set is so adorable! Beautiful inspiration again today! Thanks!! The kit is really cute. And I really like the Radiate dies! The projects with those are very creative. The Radiate dies are a cool element… and I love the card Lizzie Jones made with the Potions jars! Fall gives a chance to play with so many colors! The wicked elixir is very cool and I love the radiate dies, can’t wait to see more in the next few days! The new Radiate dies are very cool! I like all the different looks that can be achieved with them! Halloween Hugs is super cute, too. They’re too cute to be spooky, especially when they’re bringing treats! I wish there were younger kids around here, the Halloween products are so cute! Love the Radiate dies! I love the cards with the Radiate dies–they just seem to stand out! Halloween Hugs is so cute and I love the Radiate Dots. Radiate Die Collection? Yes, please! The kit is adorable. Love all the inspiration and eager for the release of new patterned paper. Did I really just say that after hoarding what I already own? great new items and cards! Another cute kit, and loving the Wicked Elixir set! The radiate die collection is some of the coolest dies I have ever seen. I also love the Halloween collection. So fun. Halloween Hugs is adorable! and the elixir bottles too, just in time for my favorite season, fall! Radient dies are sure to be a staple in the craft room! Great cards and projects today! Love the Halloween Hugs Kit, so adorable! Love the Radiate dies – the glossy accents are brilliant! Glad to see more Scarecrow cuteness, too. The Halloween sets are fun. The Halloween hug set is so cute! Love the bookmarks! So cool! I also love the radiate dots! So pretty! I really love the Radiate die collections and the Wicked Elixir collection. I think it would be fun to have another stamp set add on that used the bottles for an apothecary / herbal tonic type setting as well (hint hint)! Aww, that Halloween Hugs kit looks adorable! Can’t wait for the new release! Love the radiant dies. Such cute projects. Such fun Halloween stamps and dies. Love the Hugs characters. The Halloween cards are so cute and I love the radiate dies. I think the circles are my favorite. I wonder if you could use Wicked Elixir for a get well card too…of course you’d need to change out the labels – ha! The Radiate dies are totally awesome! What great Halloween projects! 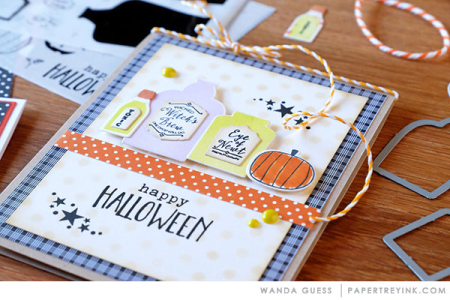 I love the sunburst dies and the Halloween kit is adorable. 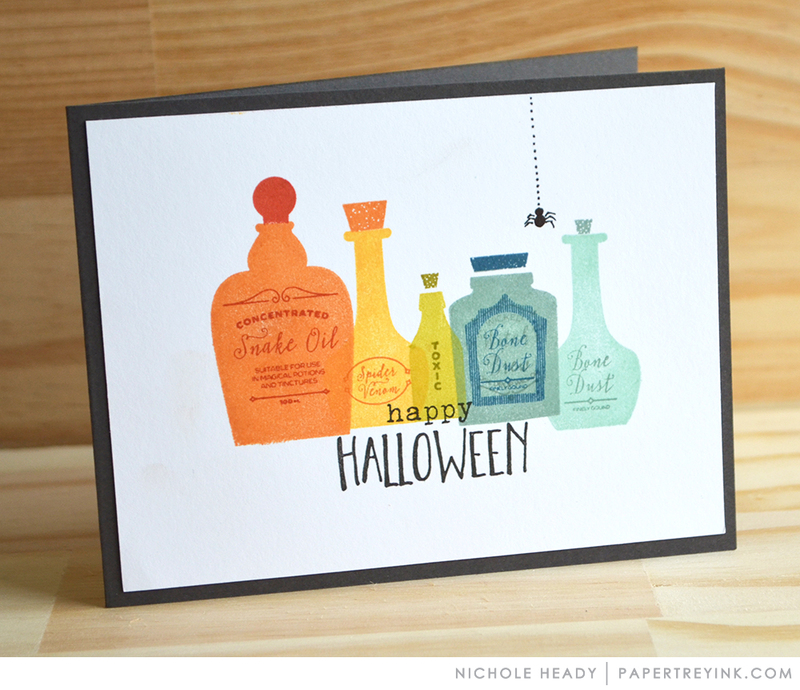 So many great Halloween projects, I really love the Wicked Elixir set, and the Sunshine dies. I don’t celebrate Halloween but the Radiate dies look great. Fun and cute for those enjoying Halloween! OK I have been buying your paper for a while, why have I never really payed attention your stamps … they are adorable … so darn cute!! Caught a glimpse of some new Dies on IG and just had to come take a look!!! So glad I did as today’s sneak peeks are fantastic! 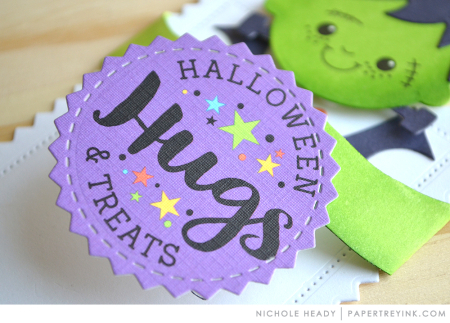 Love the new Halloween Hugs stamps and dies!!! And the Radiate dies are incredible too! Another amazing day of inspiration! 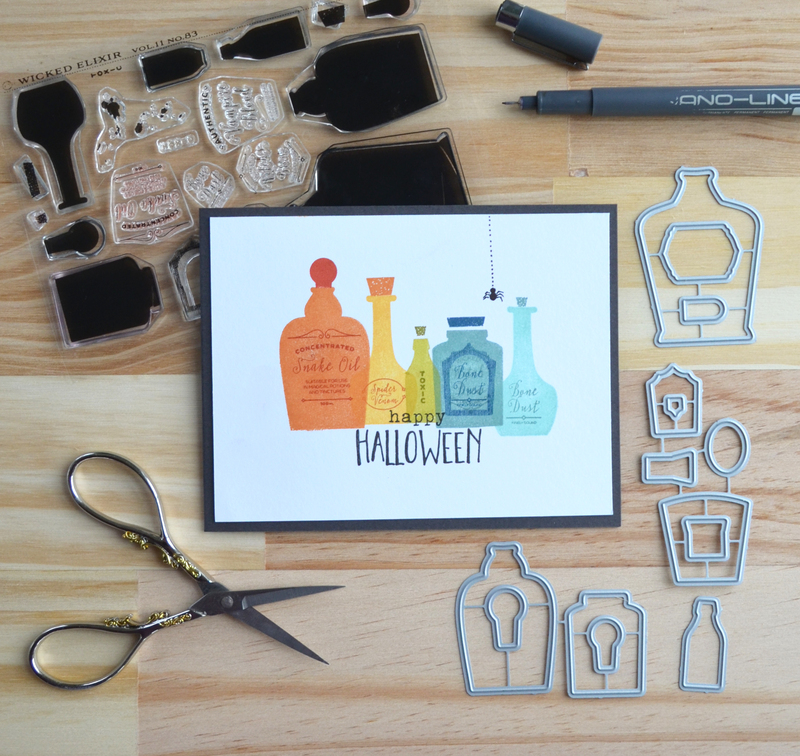 Those elixir bottles are spooky and perfect for any Halloween project. I loved the Holiday Hugs set last year and this set is just as cute. What fun for classroom treats for the kids. I love and want it all! The Halloween stamp/dies are super cute. Can’t wait to get my hands on the Halloween elixir set. I see that being used for many other holidays….Valentine’s Day, birthdays, etc….just need different bottle stamps and we are st for the year! I love the way Lizzie creates for Halloween! The radiate dies are very versatile. Such cute Halloween items. Cute Halloween stuff, love the Wicked Elixor set. Great projects! I really like the radiate dies! The radiate set intrigues me … lots of different ways to use them! 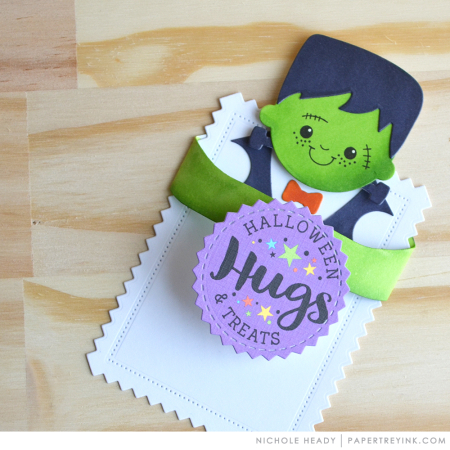 The Halloween Hugs kit is just too cute! Such an overload of cute-ness for Halloween! Love the sun dies! Cute projects today! I think I’m most excited about the return of patterned paper basics! The hugs are too cute. Love the bottles also; useful for many different looks. The Radiate Dies are awesome! They are going in my cart for sure! And there will be plenty to keep them company! Another fantastic release! Love the Halloween themed products! I love creating for Halloween and the fall, so this release looks fabulous! Lots on my list so far… LOVE Wicked Elixir! The radiate dies are so cool. The radiating dies are fabulous! Another fun day at PTI! Love all the Halloween fun! I always love the halloween projects. Very cute! I love the radiate dies. Fun Halloween ideas! Halloween is my favorite holiday to craft for. Love all the different ways the characters can be used. The halloween images are just the cutest. Can’t wait to get my hands on these new stamps and dies. I love using bottles cut from acrylic sheets and have wanted some smaller dies to use for cards. So glad you have them out! I’m looking forward to using the radiate dies! Very cool! Very cute projects! All of the sets would be a lot of fun! Lots of great Halloween projects in today’s release! Thanks so much for all this lovely inspiration. I’m LOVING everything I see. I love the radiating dots and I love that new Halloween kit!!! 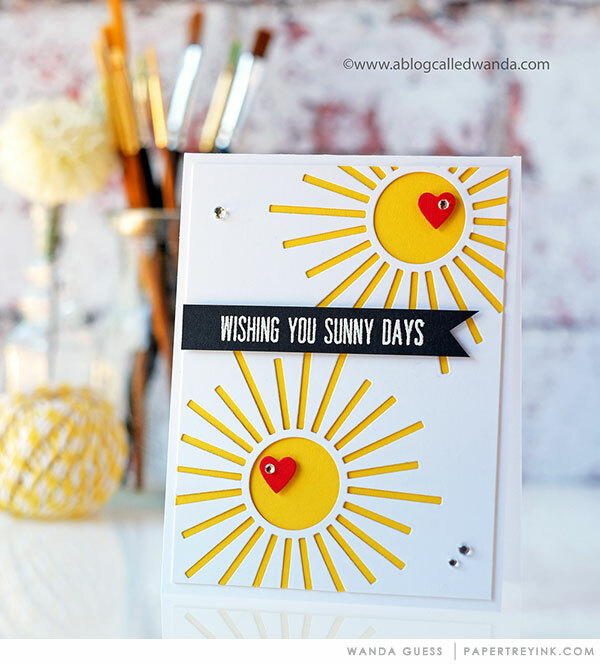 I love the fun new sunshine dies introduced today. I love all of the examples of the Halloween Hugs Kit. What a wonderful kit to have! Another A++ release day. Really digging the elixir set. Nice job PTI. Halloween Hugs is so cute! LOVE love love the new Halloween Hugs! Great creations from everyone! Love it all. The elixir bottles are great. Love your Halloween characters and the suns. Cute stuff.! I love the Halloween hugs I can’t wait to make these hugs for my daycare children. Love the radiating Ray’s dies! Halloween Hugs is right up my alley. So many ways to “treat” all our Halloween friends. Love what everyone did with the sun dies! Looking forward to seeing more of that patterned paper too! I can’t wait to get the Radiate dies! And Betsy’s kit is adorable as always. Thanks for all of the Halloween inspiration! Another great day! The radiant dies are so cool! Oh my goodness, LOVR the Halloween hugs. Totally loving the radiate dies! Love all of the DT inspiration and projects using the new MIM Mini Halloween Hugs kit as well as the Radiate dies being released. What a creative way to usher in the fall season. I love the Wicked Elixir stamps and die sets! Love the shapes ,sizes and cork/stopper options! I think I need the Radiate:Points die. Oh Boy!!!! I think the Halloween Hugs set is awesome! So many cute things that can be done with it. I’m also loving all the neat ideas with the Radiant dies!! Totally love the Halloween ideas! So fun! 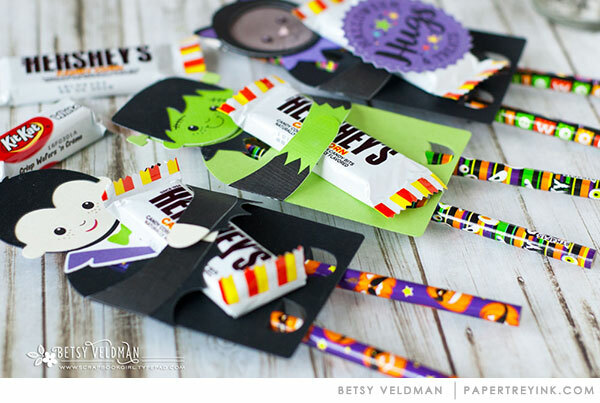 Fall is coming up and here is Betsy’s kit so creative and fun! I’m liking Wicked Elixir also. But the radiate dies look wonderful also. I don’t usually do Halloween but these are soooo cute and could be used as”happy birthday you little monster” as welll. Thank you for the inspiration! Love the Halloween hugs projects. It’s great to have a such a variety from candy to bookmarks. Wicked Elixir just cracks me up. What a fun set! Even though I am not really a fan of Halloween, Betsy always wins me over with her cute designs and products. Very adorable kit and very fun projects! As always, thanks for the inspiration PTI! Love the Halloween Hugs! So cute! So many darling projects with the new kit and I love the color dots! The radiate dies are amazing and I love Wicked Elixir! This is going to be a fantastic release! Cute new things today! Makes me ready for fall. I love all of the Radiate dies!!! So many uses from these dies. The Halloween products are really cute. I love the Halloween Hugs Kit. The design team really created some sweet projects. Love all the examples. The new Radiate dies are on my wish list, so many options. 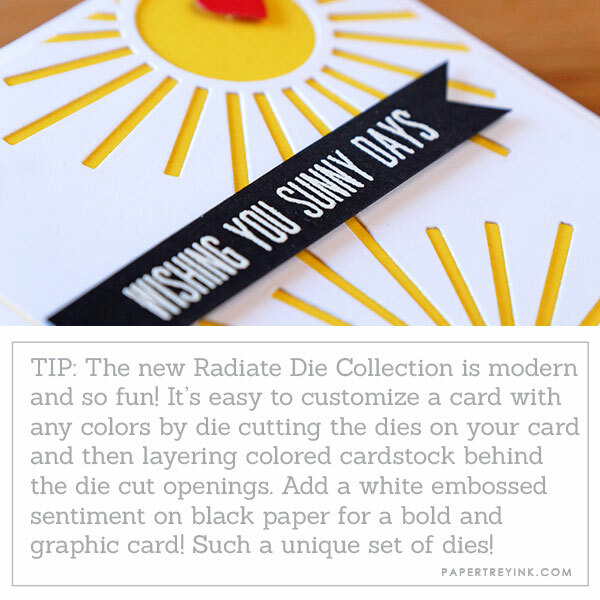 Love the Radiant Dies! The Halloween Hugs Kit is darling! Another day of wonderful creations!! Love the sun dies and the potions! Acck i can’t wait to get the Halloween huggables kit ❤❤ love love love. What a fun treat kit! Halloween is always a great release! This year doesn’t disappoint! Such a fun new release with Heather’s Autumn Scarecrow Stamp Set, Betsy’s new Halloween Hugs and Lizzie’s new Wicked Elixir Stamp Set!! Love the new radiate dies, and the Elixir set is so much fun. Absolutely love the Halloween Hugs and Wicked Elixir. Everything about this release is getting me excited for Fall. 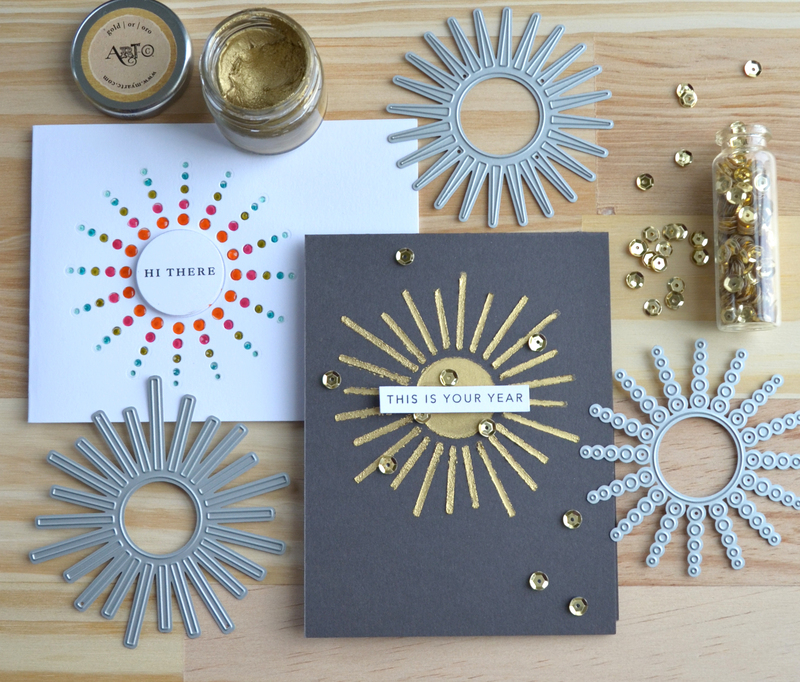 I love the radiating dies – so versatile and modern. Lizzie’s potions bottles are just too much fun especially in bright technicolour! The Indian corn is my favorite thing of this release. Oh, it’s so fun to see the fall designs arrive. My kids are grown but I do look forward to seeing all of the sweet kiddos come to the door in their costumes. These would be great for the “special” little ones in the neighborhood. So fun! I love the Radiate dies – lots of possibilities there. Thanks to your team for all these amazing samples! The radiate dies really caught my eye…how cool! The new Halloween “HUGS” is adorable. I make treats for my grandchildren’s classroom parties. These will be perfect. 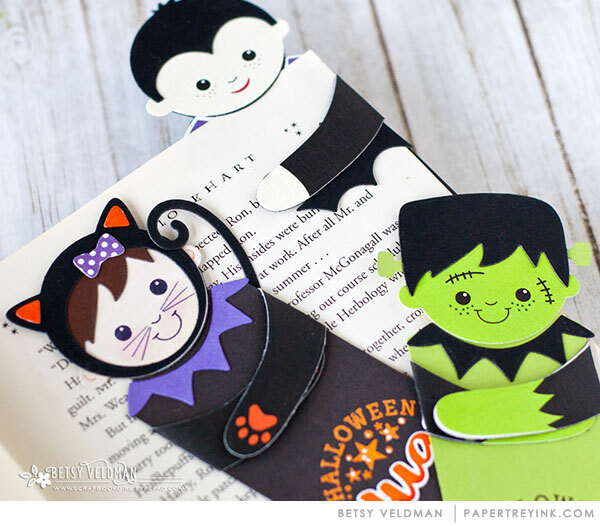 Betsy has another winner with that adorable MIM Halloween kit! I’ve been waiting for more characters for the Huggable Die! These are really awesome and just in time to start making treats for my daughter’s class! Loving those radiate dies – such a great range of options for using these. Lots of great ideas today too! Love the new halloween stamps!! Really love the elixir stamps!!! Halloween is my favorite and Wicked Elixir is at the top of my list. The Radiate dies on that list too. Radiate looks so cool and versatile! 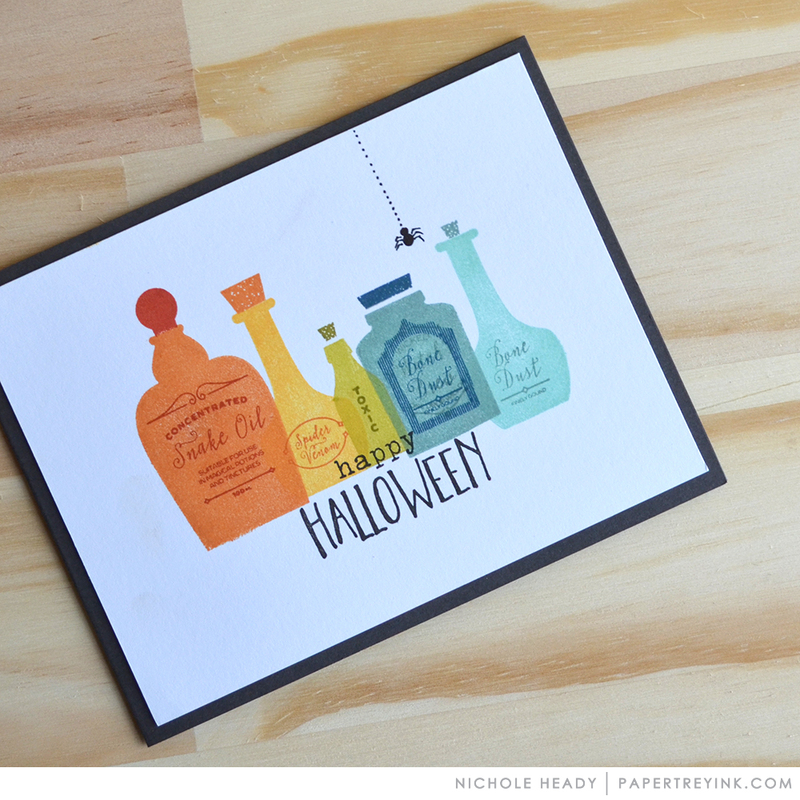 And I love the Hallowe’en potions bottles! Very fun cards and projects! It’s my first visit to this website and blog, and WOW look at all I’ve been missing! The Halloween hugs are so stinkin’ cute! I love anything that combines papercrafting and treats! And the Radiate dies are stellar! Sure to become one of my most frequently used dies. can’t wait to see what else is in store!!!! Oy. I love Halloween and fall stamps so much. well, mostly Halloween and then I love stamps about Thankfulness. Some of them I can use year round, which thrills me no end. I am not so secretly wondering if I can use the medicine/potion bottles for alcohol bottles for my drinking friends. The Radiate dies are a terrific idea! 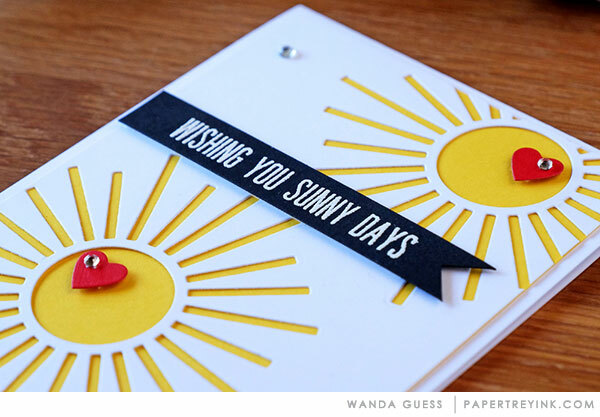 I love to make sun and sunshine-themed cards, so I am looking forward to these! That Halloween kit is ADORABLE!! So many cute ideas this month!! Love all of the projects! Such great talent! I totally need Wicked Elixir and the Radiate dies! Radiate die collection has my interest, especially the dots. Cute Halloween projects today! Thanks! 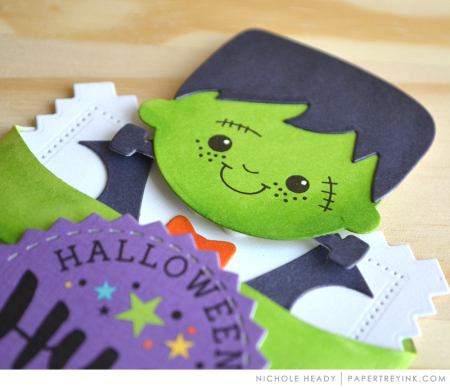 Really love the Halloween Hugs stamps and dies…so many fun things you can do with them! The radiant dies are awesome, too!! I am excited about the radiate series! The Halloween Hugs are just so darn cute, can’t wait to make little candy gifts with them. Oh, I am a sucker for Halloween stuff. The Halloween Hugs set is adorable. Fun, fun projects today. 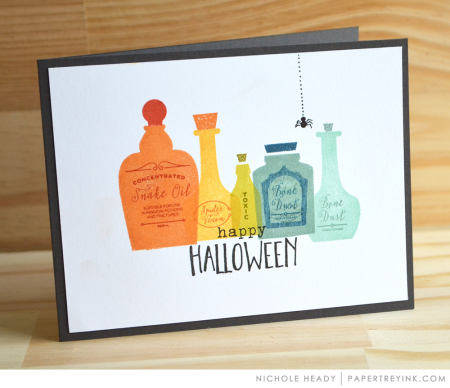 I am not into Halloween but I do like the Radiate die set. 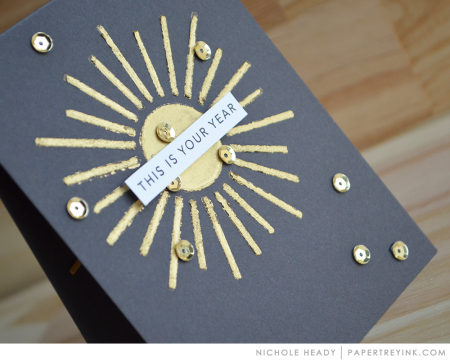 The sun dies are fabulous.So many ideas for it.Love it! I love the radiate dies! Beautiful cards made with them. Love the new Radient dies! I love the halloween items! The Wicked Elixir is awesomeeee!!! I love it! You just blow me away. I think you can’t come up with anything cuter than the last few years but you have done it again! Adorable. Betsy’s Halloween characters are just spook-tacular!! Those adorable bookmarks have captured the heart of this retired teacher. I love the way they hug the book page! So much inspiration here today! ? Very fun and cute products today! I love all of the inspiration projects! Super cute items shared today! 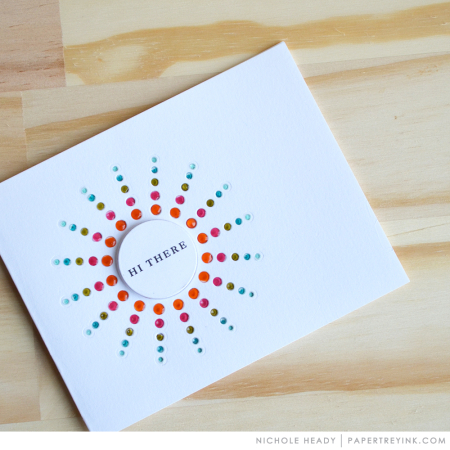 The Radiate: Dashes could make such cheerful, upbeat cards. OMG! Heather’s scarecrow is so cute! Really love the potion bottles and those sun dies! I love the Radiate Dots! The scarecrow card by Heather Nichols is so cute! Awww, how cute is the Halloween Hug set? Also love the radiate dies and the elixir set is just plain fun! What a great bunch of dies and Halloween stamps. Fabulous. So cute. Those Halloween Hugables are so darn cute!! I love the dressing down or dressing up of the radiate dies. I can see so many cards being make using here dies. Love all the Halloween treats! So fun!! love those super cool radiate dies!! The radiant dies are so much fun. The Huggable Halloween set is adorable. The little characters are so cute! I’m loving the Radiate Dies! So imaginative! So many possibilities! What a fun Halloween release! I particularly like the radiate dies. The hugs it is so cute! The kids will love these for Halloween. I really like the radiate series-they would be so versatile! The radiate dies are stunning! Love the Radiate dies so much. The kit is cute, too. Fabulous colors for Halloween. Oh what fun! Fabulous release! OMG! The Halloween hugs kit is so cute! Halloween hugs is super cute! Almost makes me wish the kiddos were still in elementary to do fun treats! Although, just doing them for friends will be a lot more doable! Love the Halloween Hugs…they are the cutest! the radiate die collection is great. have been waiting for something like this. OH I just LOVE today’s releases those bottles are awsome! I can see those bottles on a get well card take your medication Maybe perfume bottles. I am again amazed at all the wonderful cards!!! Love the Radiate Dies! Not sure if I’ll be able to choose only one. The radiant dies are fantastic, so many creative ideas are endless. Can hardly wait until the 15th! I am loving the Radiate Die Collection!! So many possibilities!! I don’t do much Halloween crafting anymore, but the faces in the Halloween Hugs set are so adorable! The radiant die series looks like a winner to me! I’m getting excited for the Fall season. Thank you, Papertrey. 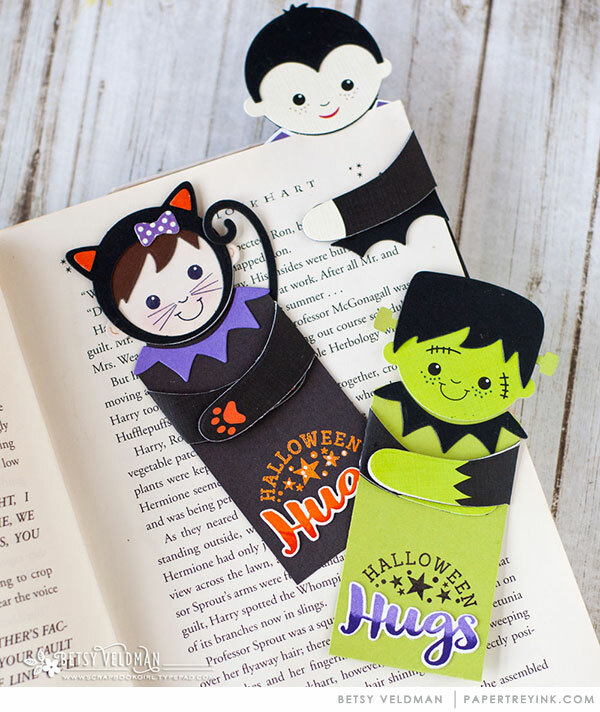 The Halloween Hugs kit is so adorable! Love it! Super cute Wicked Elixer, love the radiate dies too! The Radiate Dots is my favorite, but that Halloween Hugs kit is a close second! I’m already thinking of the treats so can make for my sons class and my coworkers!! The Radiate Dies look great! So many ideas! Wow! Those Radiate dies are gorgeous! Halloween Hugs is so adorable! The Radiated Die really sparks the imagination! Simple, yet so elegant… Love it! Oh my I need all of these! Who doesn’t love Halloween? I like the radiate dies! 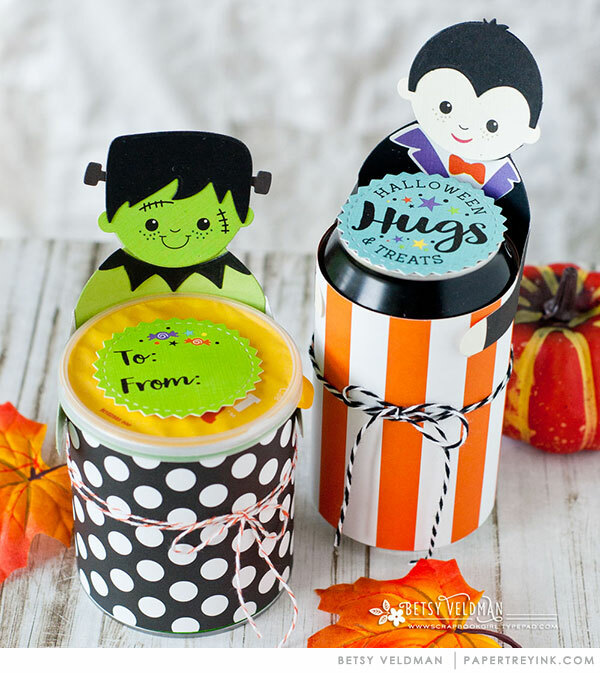 Love the Halloween Hugs kit! What a clever design! Love the radiate dies. So fun. Love the Halloween characters & radiate dies. Excited for this release. So many great products. Wow, gorgeous inspiration from the team. Feeling excited for the fall now. Oh my! Just loving all the new products. Really like the Radiate: Dots die and the multi-colored dots beneath it! The radiant dies are sooooo cool! Love the Elixirs set. It reminds me of 1950s style illustrations. I am speechless! I LOVE the new Radiate Die Collection! Something I’ve been needing for a very long time! And the Wicked Elixir is perfect too! Your projects are beautiful today – especially Heather’s scarecrow. I like the Radiate dies and the Wicked Elixir set. The Halloween items are so cute! The Radiate line is so versatile and can be used year round. Halloween Hugs is adorable. Nice price point as well. The Wicked Elixirs are a lot of fun – love the rainbow card! Can’t wait to get my hands on the Wicke Elixir set! So fun seeing all the Halloween sets! The Halloween collection is adorable!! The Halloween Hugs are very cute. I am loving the Radiate Dots die…for some reason I love circles and dots. These new Halloween sets are so fun! 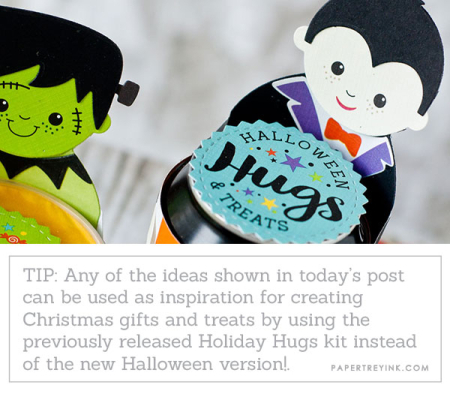 I especially love the Halloween Hugs kit! Love the Halloween kit! Looking forward to the release. Wow, love those Radiate dies, so beautiful. And love the Elixir bottles, too. Love those new Radiate dies! And I think I would use the Wicked Elixir stamps often!! The mini kits never fail to impress me!! OMG!!! The characters from Halloween Hugs are simply a must have!! They are so stinkin’ adorable!!!! Another dynamite hit for PTI. Love the Radiate Die collection. Always love the hugs! They are really sweet to add to that special gift. I used the Christmas ones a lot. Love, love, love the radiant dies! Can’t wait to get my hands on them!! This is a great release…love all of the characters for Halloween (Hugs), the elixir set, and also/espcially the radiate points, dashes, and dots! Betsy’s Halloween characters with the pencil legs are so adorable! Sold ! all of it in my cart… hurry up 15th ! Love the radiate dies! Such nice projects! Can’t wait to get the hugs!!!!! Such a cut Halloween bundle and wonderful samples showcasing them! The bittersweet rocks my world! Yet another great release. Love the Halloween items. I love all of Heather’s Autumn Scarecrow cards and tags with the scarecrows and pumpkins. These projects make me even more anxious for Fall to arrive!